Rough-and-tumble rodeo cowboy Brody Creed likes life on the move. Until a chance encounter with his long-estranged twin brother brings him “home,” for the first time in years. 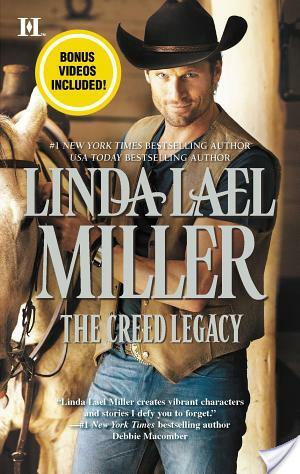 Suddenly Brody is in Creed territory—a rootless bad boy among family with deep ties to the land and each other. He’s half-ready to bolt when he meets a copper-haired beauty more restless than he is. This book was very sweet. It had a lovely romance, a bossy and gorgeous cowboy, a stubborn female and a big sprawling family. It was an easy read, but it did lack pace and, for a shorter read, did seem to drag a little in places. I very much enjoyed the relationship building between the two lead characters. Carolyn had opened herself up to Brody in a way that she had with no one else. It hadn’t been easy to allow herself to trust him, as elements of her past had given her cause to be distrusting of everyone. When he left with no explanation, he destroyed any hope of her ever trusting people again. Brody did have his reasons, but he never explained them, which really hacked me off. The girl that he had been dating before Carolyn had fallen pregnant with his child, so he ran off to marry her. I applaud the sentiment, I got p*ssed off that he couldn’t have explained that to anyone and allowed them to move on. When he comes back a broken man, I understood that he wanted to protect Carolyn. He had loved her, she was perhaps the only woman that he had ever loved, and he wasn’t whole anymore, so he couldn’t give her what she deserved. Fantastic sentiment, totally crap that he couldn’t explain. Brody was so close-lipped I wanted to slap him. Carolyn, I understood. He hurt her, without explanation, came back and started sleeping with a complete slapper, and then was bordering on rude when he was in her presence. He deserved nothing from her, including justifications on her life choices. Having had friends do the dating website thing, I had to laugh at some of the things that happened as I identified with them completely. I did melt a little bit when Brody joined the dating website in an effort to woo her; he proved to me that he was redeemable after all. It was clear from the start that both were fighting a losing battle denying their feelings for each other, but it was also clear that a lot of discussion and bridge building would need to happen to make this a plausible HEA. There were no major surprises or plot twists in their story, but there was certainly enough meat to this story to keep the story moving. The thread running through this story was the continuing relationship of Brody’s twin brother, Conner, and his wife Tricia. Tricia is pregnant and, as Brody and Connors mother died in childbirth, he is a very anxious daddy to be. I liked this element of the plot, it was mature, realistic and quite heart warming. I liked that their story didn’t stop with their HEA; I love series where we don’t ignore previous characters that we grown to know and love. All in all an easy read with believable characters and a sweet love story. The character building was one of the strengths of this book and I enjoyed getting to know this tortured cowboy and his family. Great review! Will have a look on Goodreads :-).